A multicab driver died while eight of his passengers were injured when a passenger bus hit the vehicle they were riding in along the national highway in Bacuag, Surigao del Norte, a police official said yesterday. 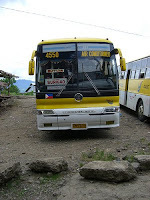 Chief Inspector Nelly Villagarcia, chief information officer of the CARAGA Regional Police, identified the lone fatality as Luis Patriana, 60, driver of the multicab. The injured victims, she said, were Pablo Ramirez Jr., Adelaida Eliazar, Wilmar Mollanda, Riza Crispo, Renzo Ortiz, Glorino Ortiz, Janet Gromez and Michael Simoy Cudillo, all passengers of the multicab. "All injured victims were brought to Caraga Regional Hospital Surigao City for medical treatment," said Villagarcia. The official said the multicab was travelling along the highway in Bacuag town when the bus bumped their vehicle at the vicinity of Sitio Hinatigan in Barangay Poblacion at around 10 a.m. on Saturday.